Great DIY Foodie Gift Idea! Preserving lemons is a pickling technique where lemons or other citrus fruit are packed in salt and citrus juices. Preserved lemons are often used in North African food, particularly Moroccan food, as a savory ingredient. They are prized for their intense zest but also work very well pureed into vinaigrettes (how to make a vinaigrette) and beurre blanc for applications like our Sockeye Salmon with Preserved Lemon Beurre Blanc recipe. Usually (but not always) the pickled citrus fruit is rinsed prior to use, so that the brine clinging to it won’t unbalance salt levels in your dish. 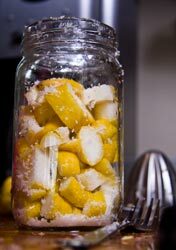 We used Meyer lemons for this because they have a sweeter, less acidic flavor than conventional lemons, resulting in less acidic preserved lemons once the pickling process is over. You could also use this same recipe for plain lemons without making any changes. 1. Juice half the meyer lemons. 2. Slice the other half into quarters, three quarters of the way through (they should stay connected). 3. Pack the gaps between the quarters with salt (see photo for visual reference). 4. Pack the quartered lemons into a jar tightly, cover with the lemon juice. 5. Cover the mouth of the jar with two layers of plastic wrap. 6. Seal & store at room temperature for at least 30 days before using. Update: We opened the preserved Buddha’s Hand and it ended up being too mushy to use…perhaps because it’s all pith? We preserved a Budda hand and it came out great! We did not cut it though. We simply put it in a large jar with salt and meyer lemon juice. You need to let it sit, shaking it every day. It took about 2 months to penetrate the entire hand. So it sounds like the below recipe will work, just leave the Buddha Hand whole (you’ll need a really big jar) instead. Buddha hands are known for their complex flavored, intensely aromatic zest…but they don’t really have any juice. To solve this problem, we’ve paired them with yuzu juice, which will add even more complexity to the preserved result rather than simply blanketing it with lemon acidity. 1. Slice the buddha hand into ½” thick cubes/rounds. 2. Put ½ tbsp of salt in the bottom of your jar. 3. Add a slice (or layer of slices if using finger slices) of the buddha hand on top of the salt. 4. 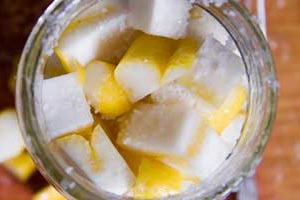 Top with another ½ tbsp of salt, continue alternating buddha hand and salt until the jar is full. 5. Add yuzu juice to cover. 6. Cover the mouth of the jar with two layers of plastic wrap. 7. Seal & store at room temperature for at least 30 days before using. I have some preserved lemons that are just now ready to use. Any ideas? Sure Pam! 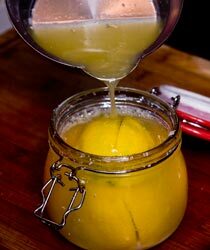 Preserved lemon vinaigrette (mentioned above) can be used as a salad dressing, salmon marinade, or to dress crab salad (with or without greens). We have a recipe for the vinaigrette (although you’ll find a more rustic preserved lemon vinaigrette recipe here) as well as one for a peekytoe or Dungeness crab salad coming up on the blog soon!